So, it was a rainy day, and the cat was bored and whining and following me all over. And so, when I felt something touch my leg, i was sure it was her rubbing up against me. And then I looked down. And there was no cat there. And now i felt it more distinctly, something touching my shin……..
Instantly, almost reflex, i pulled up my pants leg…. Whooooaaaaahhh!!! It was crawling up my leg, just coming over my sock and touching bare skin at my shin. A spastic motion with my hand and i had brushed it off, and the moment i saw it was off of me, sprang out of my chair and did a squiggly, squirmy dance. In fact, i could not stop whigging for a few seconds, or half-yelling. After dancing around, i got the pliers from the drawer, a tool of preference, and all the whole corralling it away from places it might escape, slip through a crack or under furniture, i grabbed it with the pliers. Notice the funny way i am holding those pliers, so my hands are way at the end. One false move…….this baby’s LONG!!! Had to make sure i grabbed him right in the middle, too. My cat failed. She was supposed to find this before it found my leg. She has found a few earlier this season. Rain always brings them up from outside into the house. They are looking for high and dry ground, and they often fall from the beams, that is how high they get. This is the second time this has happened to me, in fact. The first one was pre-cat, but it crawled up my leg just like this one. Ew. Gotta keep an eye out…. This one did not make it very high, though. He was a fatty. When i catch these guys, they get flushed down the toilet. So, that is where this guy went. Maybe next time, she’ll find it first. OK, back after disaster.. I was frozen for a while, but I’m back in action. It’s a warm day. Spring is on it’s way. the wind is blowing from the south today, which is the summer pattern. 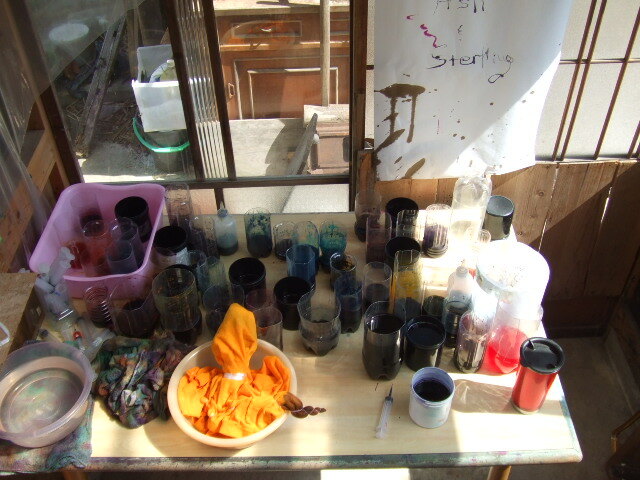 This is my dye table, after a much too cold winter. Lots of cups, too many. Winter being cold, dye liquid keeps for long. So I just can’t throw things away, so after a few months, it’s gotten to this. I need to do socks or something else to get rid of it. That’s a hemp tee with a mandala sticking out to th side there in process. It’s starting out super-yellow. The owner has instructed me to make it not so yellow.